I did the mochi skin and the rest are done by my domestic helper. I did a few at the beginning but was getting lazy so my helper took over and did the rest. LOL. The black ones are redbean paste and the white ones are greenbean paste. 1. In a glass bowl, put glutinous rice flour + water mix well to paste, then add sugar and mix till dissolved. 2. Cover with plastic wrap and microwave for 2 minutes. It will be half cook remove and stir well…move quickly…must do it while hot and have to be fast. Cover and return to microwave for 30 sec. Stir well. You may need to repeat this step for few time…..due to heat of individual microwave (should not more then 30 second at a time or you will over cook or burn it). 3. Sprinkle some corn flour on working top. Divided dough in to 10 pcs. (Use spoon dip in corn flour for help in dividing and with your hand). 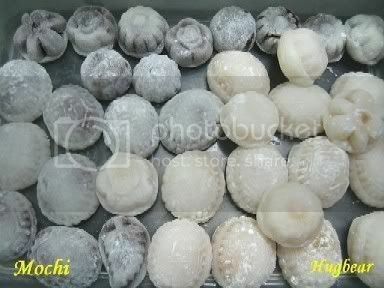 Divide red bean paste to 10 pcs. 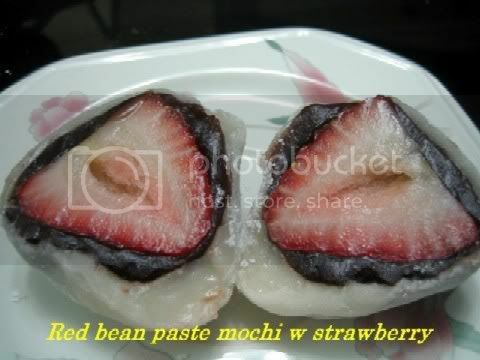 Wrap red bean paste to cover strawberry (leave sharp part or end of fruit expose, will be nicer with red and white color…do try them). Then cover red bean paste with dough. Try to make it to round shape. The mochi looks yummy. Care to share the recipe/steps? Hi Lee Lee. thank you so much for sharing yours tested recipes with us.I too would love to have this recipe. I do hope you can share with us. How do you make them into the shapes??? I mould it into round and pushed it into plastic or wooden moulds and then knock it out. Like how you would do with ang ku kueh. The mini type of mould is cuter. the mochi looks great however what is 180cc water is this 180ml? 180 cc = 180 ml of water. this is my first time to your blog...nice mochi u made..i would like to make them but i do not have microwave at home :( .. without a microwave, can i still make these mochi?? look forward to your reply soon. Thnx. Hi gossiping, you can try steaming the mixture if you don't have a microwave oven. I was wondering if you could use chocolate ice cream instead of the red bean paste around the strawberries? If so what would the best way to do this be? your mochi looks great ..where can i get all the ingredients from which spermarket?? I've been looking for this recipe since forever.Thanks to you I don't have to look no more.I do have a questions though. After the MOCHI have been filled with what ever fillings of our desire what do we do we the MOCHI? DO we boil them steam or microwave to cook it? The mochi skin would have been cooked during the microwaving process. So after wrapping with filling, you just need to coat it light with the corn flour to prevent sticking and it can be consumed straightaway. Hi! Thanks for the recipe! I like your blog very much! I'm starting to learn cooking and very tempted to try this. May I know what is the microwave heat power used?? My microwave oven is 800 watts and I used high. What type of plastic wrap to be use? Those ntuc plastic bag? & What to you mean of sprinkle some corn flour on working top? I used Clingwrap. Sprinkle some corn flour on the table where you will be putting your cooked mochi on so that it will not stick to the table top. Wouldn't the mochi be stuck in the mould when you put it in? Did you put a layer of cling film to line the mould before putting the round mochi ball in? Also, can we actually eat raw cornflour? I tried this recipe yesterday using Japanese glutinous rice flour bought from Daiso. The dough was extremely sticky. It's almost impossible to shape it as it just stick to my hands. In the end, I had to struggle with 2 spoons to do it. But the effort was worth it...the mochi was great - very smooth and soft, though I think they were too big (abt 4cm dia!). Hi Quinn, what I did was to flour the mould (I used wooden mould). I used the uncooked corn flour to help in handling the sticky dough. It is ok to eat the corn flour raw and to me it didn't really tasted raw. Just like how you would taste those mochi sold outside with a light layer of flour dusted on it. hi I have try the mochi but is very sticky to do it and I steam it also very sticky.Can u advice how to make it like yours cause my family like mochi. Lilian, it will get sticky, cannot be avoided. Just need to use more corn flour to help you or a little oil on your hands to prevent sticking too much. Or else use plastic sheets to roll the dough but oil the plastic sheets first. Good luck in finding one in your nearest supermarket. Ria Lauren, I bought it from Phoon Huat, which is a local bakeware shop.